October 13 is the National Yorkshire Pudding Day in the United States. This food-related holiday is dedicated to an iconic British pastry which is a staple of the traditional British Sunday roast. Yorkshire pudding is made from batter that consists of flour, eggs, and milk or water. Yorkshire pudding batter is similar to pancake batter. This pastry is usually served as a side dish with roast meat and gravy. Sometimes it is also served as a dessert topped with sugar, jam, or golden syrup. The exact origin of this dish is unclear. The first recipe was published in 1737 under the title of the “Dripping pudding” and the name “Yorkshire pudding” was first used in 1747. It still remains a very popular dish in Britain. 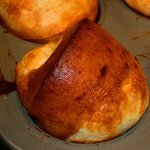 An American version of Yorkshire pudding is called a popover. To celebrate the National Yorkshire Pudding Day, try your hand at cooking this pasty. First, beat 2 eggs together until light. Add 1 1/3 cup milk, 1 cup flour, and 1 tsp salt. Beat well, cover, and let stand for 1 hour. Preheat oven to 450 °F. Fill muffin cups 1/4 full of beef dripping or oil and put in the oven until the fat is sizzling hot. Then fill each cup 1/2 full of batter, place in the oven and bake for 20 minutes, gradually lowering the temperature by 25 degrees every 5 minutes.